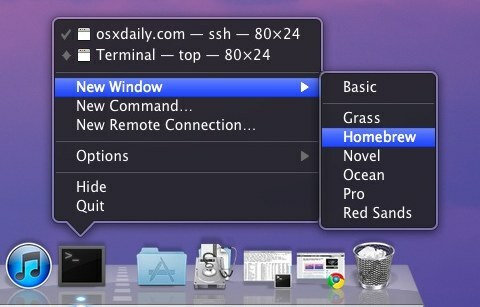 You can quickly launch a new styled Terminal window through the apps Mac OS X Dock icon. Just right-click (two-finger click for trackpad users) on the Terminal app, navigate to “New Window” select a preconfigured style. You can create your own color styles, but some of the defaults are just fine. Basic is just simple white on black text, Homebrew is the traditional DOS style of green text on black, Ocean is white text on blue (seen below), and Pro is the inverse of Basic. Grass, Novel, and Red Sands are, well, ugly. If you’re already inside the Terminal app, you can also do this from the File menu. 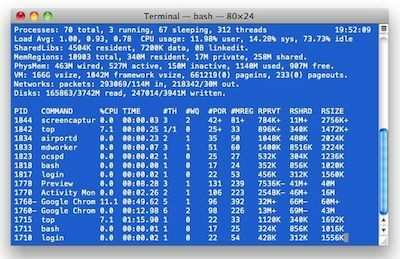 Right-clicking on the Terminals Dock icon has several other features, including the ability to execute new commands directly from the Dock itself.